This document was written by the New York Early Childhood Professional Development Institute (PDI) is a public-private partnership that includes city agencies, private funders and the City University of New York (CUNY). Its goal is provide a comprehensive system of professional development for individuals involved in early childhood education. These five domains are separated into three age groups: • Infancy (Birth to 18 months), Toddlerhood (18 months to 3years) and Preschool Age (3 to 5years). Download the NY ELG PDF here. 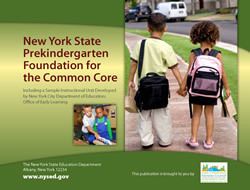 The New York State Prekindergarten Foundation for the Common Core provides a framework that focuses on learning and development for the 4 year old child. The document includes a sample instructional unit and instructional template. Download the document here. The New York City Pre-K For All program has its own standards, called the Pre-K for All Program Quality Standards. that help children meet the milestones outlined in the New York State Prekindergarten Foundation for the Common Core (PKFCC). Grounded in the NYCDOE’s vision for school improvement across the pre-K to 12 continuum, the DOE Framework for Great Schools, the Pre-K for All Program Quality Standards establish a shared set of expectations for pre-K programs across all settings. You can download the Pre-K For All Quality Standards here. In 2005, New State joined the QRIS movement, a program that uses assessment, coaching, professional development, and a wide range of resources to help early childhood programs provide the best possible care for children from birth to age five. Starting in 2017, joining QUALITYstarsNY has become easier. Their Start with Stars program training and other resources to help kickstart a process of continuous improvement. Here are the center-based QUALITYstarsNY standards. They cover all aspects of being a successful early childhood education provider. Note, centers are expected to use a curriculum that aligns with Prekindergarten Foundation for the Common Core and/or the New York State Early Learning Guidelines. Educa helps educators incorporate the New York standards into their communication with parents, creating understanding and engagement.